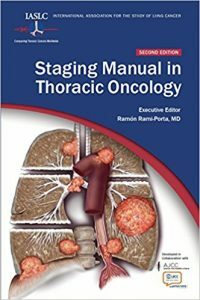 The Second Edition of the IASLC Staging Manual in Thoracic Oncology reports on the latest revisions of the tumor, node and metastasis (TNM) classifications of thoracic malignancies, namely, lung cancer, malignant pleural mesothelioma, carcinoma of the esophagus and of the esophago-gastric junction and thymic epithelial tumors. Staging lung cancer correctly ensures the best care for patients. BTOG and the IASLC are collaborating to reach lung cancer specialists in the UK and Ireland. Watch this presentation from the BTOG Annual Conference 2018 by Dr. Matthew Callister, Consultant Respiratory Physician at St James’s University Hospital in Leeds, Member of BTOG Steering Committee and IASLC Member. The Journal of Thoracic Oncology published 30 articles as part of the presentation of the new staging system.